Essential plot rundown: Two people get married, get pregnant, and can't decide if they want the baby or not. Yes, I went and saw Breaking Dawn. Why, I do not know. I should've saw Real Steal or something. But, too late now. So, I went in only having seen the first one 3 years ago and my preconceived notions that it sucked. However, to my surprise, it sucked so bad it was fun. The whole time I just laughed at all the stupid stuff that happened. So, it was fun watching the movie, but the movie itself sucked. Judging from the trailer, I was expecting the movie to focus more on the wedding. But, that happens real quick, at the beginning. Well, not real quick, it felt like forever (as did the whole movie). So, they get married right off the bat and move on. And this is where the only good part of the movie happens. Bella has a dream or something about her wedding. Everyone is wearing white and it's raining rose petals (cuz that makes sense). But then, everybody is dead and bloody! Oh no! But not really. This scene was not dramatic at all. It was bland. However, I thought it was visually well done. Just the contrast of red and white looked cool. But it had no emotional impact. As a matter of fact, the movie as a whole made no emotional impact. Not once did I care for the characters or what they were doing. Well, that's a lie. I kind of did once, when Bella drops her cup-o-blood, bends over to pick it up, and her back breaks(?) That was the only part that made me gasp/care about what was happening on screen. But then I was like: Edward, what are you, a jerk or something? Why didn't you use your super quick, blurry action and get that cup for her? Another thing that bothered me was the mood. It seemed to switch too often from one mood to another. When Bella and Edward first get to their honeymoon cabin, she is super nervous about what is going to be happening soon. She goes into the bathroom to get ready and it switches to romantic-comedy mode as she tidies herself up. Then, just as quickly, it goes back to dramatic mode. Wait, what? What am I suppose to be feeling here? The pacing of the whole movie seemed off. Then, there was the bad acting. Kristen Stewart can't act; neither can the guy who plays Edward (can't remember his name). The only one I felt did an ok job, was Taylor Lautner (I'm not sure why I remembered his name). But, he wasn't anything too special. And the dialogue is bad too. In one scene where they are talking about Bella's kid, they keep referring to it as "it" or "fetus". Then some girl says "Why don't you call it what it really is? A baby." Then this other guy responds by saying "Probably." Probably? It's probably a baby? What else would it be? A midget? I laughed really hard at that. There were some other moments, but I can't remember. A different thing that bothered me was the music. Most of the music was popular music (is that what it's called when it's not a score?). I don't know what songs they were, or if they were written for the movie, or whatever. Just the fact that they used them all the time bothered me. And for some reason, they never really seemed to fit the mood of the scene. The SFX were bad too. Whenever the vampires ran or moved fast, it just look weird. Actually, it looked flat out bad. The wolves also looked bad. Never did I think that there was an actual wolf there. It always looked CG. Now, I know it is hard to animate fur and hair and what not. But still, it was bad. Then comes the part that I'd been waiting for: Jacob chews out the baby. I was interested to see how they would show that. But when it happened, they just used a scalpel to cut her open. What? That's kind of lame. Afterwards I ask one of my friends about it and she said that he did chew her out, that was why there was blood on his face. Then I realized my mistake. Oh, it was Edward! I thought it was Jacob for some reason. It was also during that scene that I realized something. The whole time I was watching the movie, I was thinking it was part 1. But when Bella was in labor, I thought it was part 2. Doesn't the series end with her giving birth? Huh. This must be part 2. 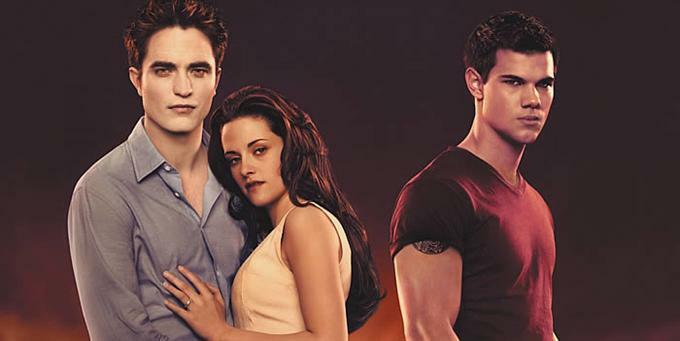 Sweet, no more Twilight movies. But, when I was talking to the aforementioned friend, she pointed out my mistake. And that in part 2, there is a vampire war or something against the Italians. Yea, I thought Dakota Fanning was suppose to be in this. So, to make a long story short: this was not a well made movie. The acting, dialogue, SFX, etc were all bad. I also did not really understand the plot at all. Why is everyone freaking out about the fact that she's pregnant? Why do they call the baby "it"? Why do the wolves want to kill it, I mean the baby? Why does Edward have weird looking teeth? Why am I watching this and not Chronicle? But, to the movie's defense, I haven't read any of the books or seen movies 2 and 3. But, that's besides the point. The movie sucked; but it was good for a laugh. I disagree...it wasn’t THAT bad!! True not that much happens in the movie, but that’s because most of the book is in the heads of the characters, which creates a dull movie. That’s funny you thought Taylor did the OK job at acting because I think he’s so bad! But Kirsten Stewart is pretty bad too, she only has two expressions. I also find the music very appropriate for the movies. Stephanie Meyer loves that kind of music and has a playlist for each of the books…so I think it works. Didn’t you think they did a good job making her look sickly? I thought it looked believable. It. Was. Horrible. And the reason that Kirsten Stewart looked so believably sick was because, after filming 4 Twilight movies, she really was deathly ill. I heard that she actually flatlined after they told her that this was only part 1. Oh...and I like your blog.